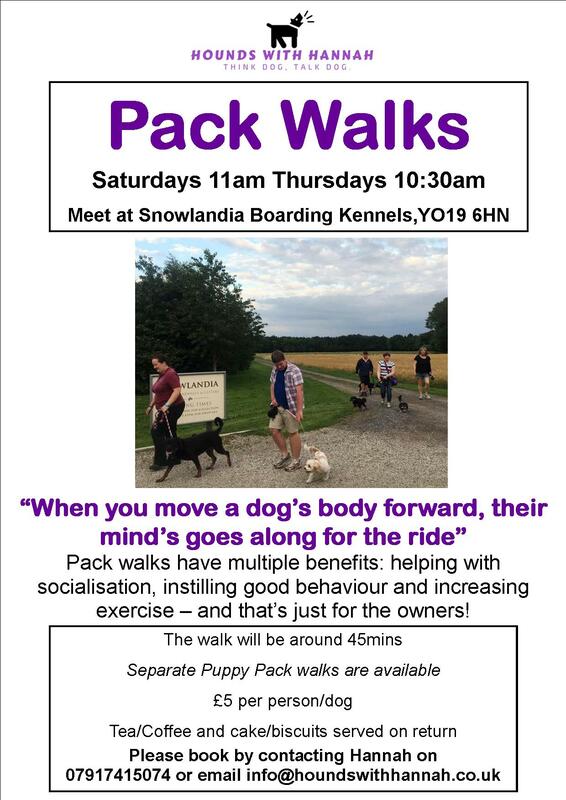 Pack walks have multiple benefits: helping with socialisation, instilling good behaviour and increasing exercise – and that’s just for the owners! Instinctively dogs would roam in packs in the wild and ‘pack walks’, help dogs engage in this natural pack behaviour while being on a lead. Experiencing new sights, sounds and smells is crucial in developing a dog’s ability to handle new situations. It desensitizes them to noise and distraction and helps them stay calm in crowded streets, or with other dogs. Whether you have a nervous dog, a bouncy playful dog or a dominant overpowering dog pack walks are a great way to get together with like minded people and walk your dog alongside other dogs. This can help bring out confidence in nervous dogs and will calm a bouncy dog as the dogs will feed off each others energy and if there is a calm confident dog at the front leading the walk, the other dogs follow suit and copy the behaviour. Pack walks are also great exercise. Anecdotal evidence shows group walks can drain a dog’s restless energy and keep them mentally and physically fit. It’s also intellectually stimulating for the dog to meet different types of dogs and people.